Olton station opened in 1869 on the GWR's Oxford & Birmingham Branch and despite some considerable 'rationalization' of track and buildings over the years is still an appealing station. 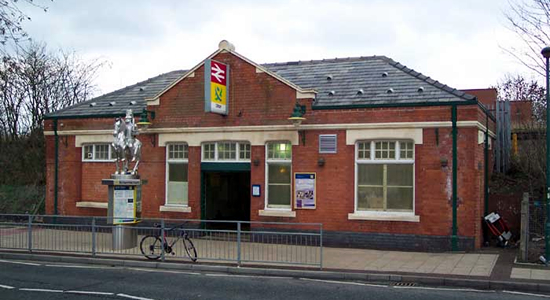 Above we see the entrance building on Station Drive which is the original structure and, apart from the window on the left-hand side being bricked-up, is as it was when opened. 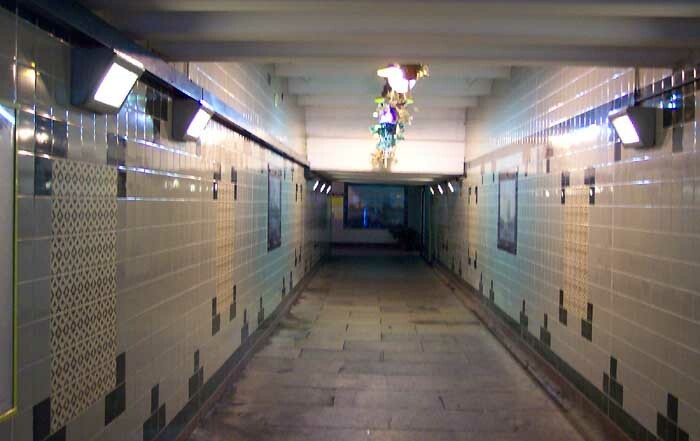 The interesting feature here is that the entrance seen in the centre of the building leads into a tunnel which runs under the tracks providing an access staircase to the platform(s). Above-left we are standing just inside the entrance from Station Drive and are looking along the tiled subway which provides platform access via a staircase on the left-hand side. Unfortunately, some alteration has taken place here because, as we will see, the platform layout at track level has been significantly altered. However, it is extremely clean and well kept with even hanging baskets for decoration - it's nice to see some effort going into making the use of railways a pleasant experience: a lesson which could well be heeded by staff at some other stations I could mention. Above-right we have emerged from the subway onto what is now the only platform - an island platform with trains to Leamington stopping this side and to Birmingham the other. The track in both directions has been singled and the platform building significantly reduced by the removal of its roof canopy. Above-left we are on the Leamington side of the platform looking in the direction of Birmingham and above-right we have moved back from the previous shot but are still looking in the same direction. 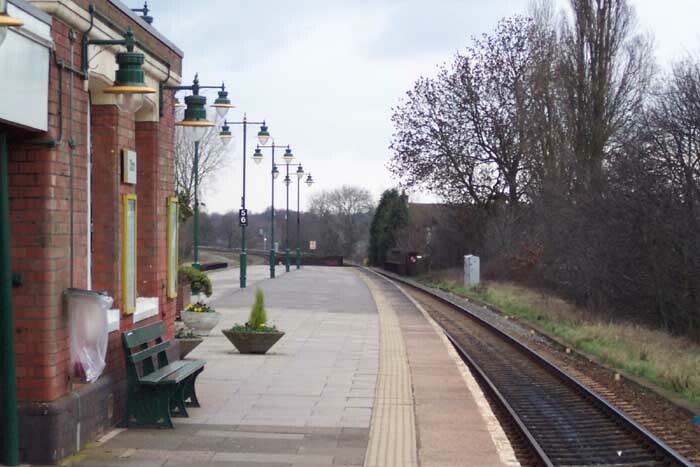 This view gives a good perspective of the station and you can clearly see what was the Leamington platform standing disused and overgrown to the left of the shot. Additionally, you can see a modification to the platform building nearest the camera whereby the strange 'tower' structure is the top of the lift shaft installed for disabled access to the platform from the subway. Above-left we are looking towards Solihull and can see the girders of the bridge over Warwick Road which also serve to further outline the loss in trackbed experienced at this station. Finally, above-right we have moved back a few yards from the previous shot to gain a greater perspective of the full width of the station.